Today, LaGrange College is a private, four-year liberal arts and sciences college, affiliated with the Methodist Church in LaGrange, Georgia. LaGrange College actually opened its doors as a female college in 1831. 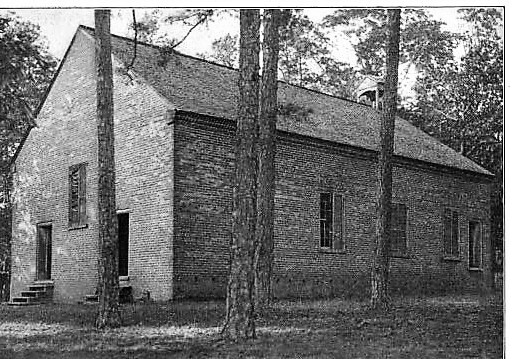 But another college named LaGrange, also affiliated with the United Methodist Church, opened it’s doors in Alabama in 1830 and is still in existence by another name today. 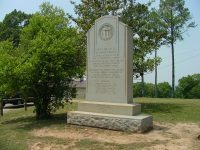 A year earlier than the LaGrange College in Georgia, on January 11, 1830, LaGrange College, also affiliated with the Methodist church, opened its doors in a mountain hamlet called LaGrange four miles southwest of Leighton in eastern Colbert County, Alabama. The village of LaGrange was beautiful for situation, affording picturesque vistas from every direction, and the climate during the Summer months was unexcelled anywhere in the South. So charming was the place in every respect that the wealthy people of the valley used it as a resort during the heated season, and in the course of years decided to erect a college there for the education of their sons and an academy for their daughters. Donations and subscriptions were accordingly made and a church, a college, and academy were built. Lawrence Hill on LaGrange Mountain was selected as the site for the new school which opened it’s doors in 1830, almost a year before the University of Alabama opened its doors in Tuscaloosa: two years before Randolph-Macon in Virginia; seven years before Emory & Henry, Virginia; twenty-four years before Trinity College in North Carolina; twenty-one years before Wofford, S. C.; and sixteen before Howard College in Alabama. “At the division of the Methodist Church, it was one of the foremost in the United States. Eight days after LaGrange opened, the Alabama Legislature issued a charter, making it the first state-chartered institution to begin operation in Alabama. “On January 19th, 1830, an act of the Legislature establishing La Grange College was approved making it the first chartered college in the state. Rev. Robert Paine was the first superintendent, and among the instructors were William Hudson, professor of mathematics and modern languages, and R. Sims, of ancient languages. In 1840 Dr. Barbour resigned and Prof, Henry Tutwiler, one of the most distinguished educators of the South, was chosen to fill the chair of chemistry and mathematics. 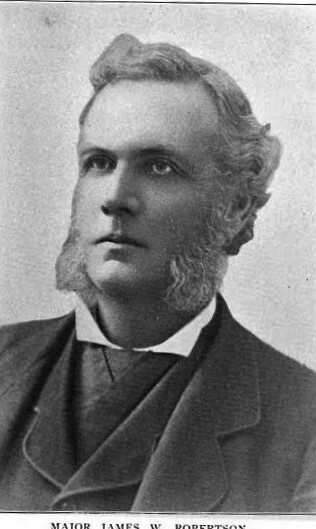 Dr. Richard Rivers, well-known instructor, and an author was also associated with the institution for a number of years. La Grange numbered among its alumni many who in after years achieved notable success, Dr. John Allen Wyeth, M. D., LL. D., whose statue stands in the Capitol grounds at Montgomery, Alabama, was at one time a student there.” (The Alabama Historical Quarterly, Vol. 14, Nos. 01 & 02, 1952.) Twenty-one local college trustees were listed in the Acts of Alabama, Eleventh Annual Session. Students attended classes in two three-story brick buildings. The first board of trustees had fifty members which included two Native-Americans, a Choctaw politician, and a Cherokee leader. Rev. Robert Paine who later became a Bishop, was the first president. 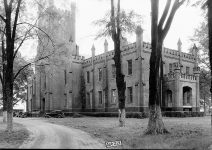 For twenty-five years La Grange continued to flourish, but in the Autumn of 1854 when Dr. Rivers became President of the college, he faced a crisis, the college buildings were dilapidated, and a long-standing debt was hanging over the Institution. 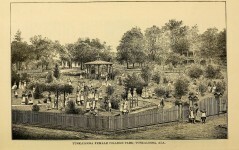 The citizens of Florence, Alabama, a town on the opposite side of the Tennessee river, urged its removal to that place and offered such great inducements that contrary to the wishes of the students and many members of the faculty the deal was finally consummated, and in 1855 the doors of LaGrange were closed. The people of the growing town of Florence offered better buildings, and a more ample endowment, as well as a larger local patronage. They also stated that they would pay off the College’s indebtedness. 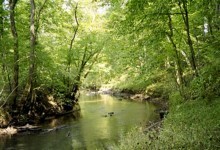 The Alabama, Tennessee and Mississippi Methodists Conferences agreed to their offer and “directed the removal of LaGrange College to Florence, Alabama.” It is said that the town of Florence gave an endowment of $20,000. The Trustees at the old LaGrange College resisted the change and reopened the institution at the old site in February 1858 under the name LaGrange College and Military Academy,4 with James W. Robertson as superintendent. They opposed the continuation of the same name at the new location, so the old name was finally abandoned and friends of the college at the new location requested a name change. A meeting was held at the Masonic Hall, and the name of LaGrange College in Florence was changed to Florence Wesleyan University. At the session of the Tennessee Conference held in October 1855, R. H. Rivers was recorded as the President of La Grange College, at Florence for the last time. The college re-opened in Florence with Dr. Richard Rivers as president, and the name changed to The Florence Weslyan University. 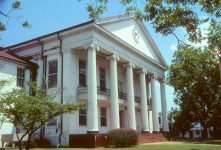 A new charter was granted by the General Assembly of Alabama for the Florence Wesleyan University and in spite of the La Grange Trustees protest, the college was reopened with the new name in Florence, Alabama on February 21, 1855. 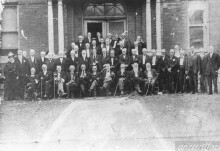 The entire Faculty, being Methodists, chose to be governed by the Tennessee and Mississippi Conferences: and a large majority of the students went to Florence. The Florence Weslyan University continued to operate under this name until the Civil War broke out, at which time it was obliged to close. It opened again in 1872, but at that time, and for a number of years afterwards, was known as The State Normal College. Meanwhile, at the old location, the Trustees limped along as a LaGrange College literary institution until 1857. Then the college was re-organized as a military college. It reopened in February 1858 under the name LaGrange College and Military Academy,6 with James W. Robertson as superintendent. Additional buildings were constructed and the school reached an enrollment of 171 students. The name was abbreviated in 1860 to LaGrange Military Academy by the Trustees. 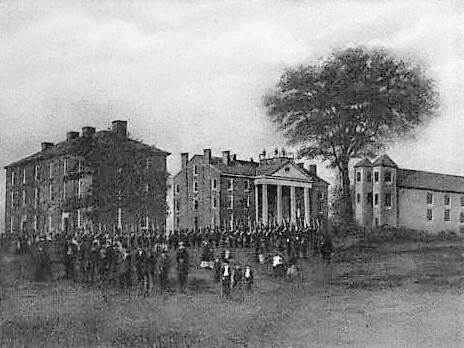 Since 48 students were cadets in 1861 when the Civil War broke out, the school suffered a major loss of enrollment when Alabama seceded from the Union. When the Federal Army approached the college in 1862, the college doors were closed. By this time, practically the entire Corps had entered the Confederate Army. Most of the cadets were in two companies which made a part of the 35th Alabama Infantry with Major Robertson elected as Colonel. After the college closed, “Professor Williams continued to teach a private school for several months in the chapel. 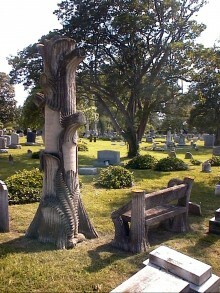 This he soon abandoned and returned to the home of his childhood in Massachusetts. His son, Robert, however, remained in the South, joined the 16th Alabama Infantry, and died while in the service of the Confederacy. The buildings remained unoccupied until on April 28, 1863, when they were destroyed by fire by the Federal Cavalry under the command of Colonel Florence M. Cornyn. All the buildings of old La Grange College were burned by Federal troops under Gen. Cornyne, April 28th, 1863. The libraries, consisting of about four thousand volumes, the chemical and philosophical apparatus, a cabinet of minerals, and all the furniture were also burned. 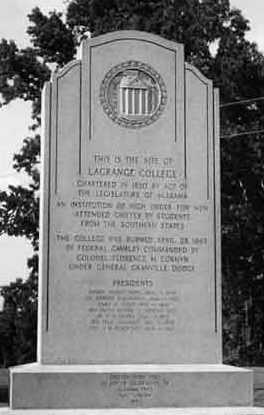 Today, only a monument remains on the site denoting the location of the original LaGrange college. The bricks and even the foundation stones have long ago been hauled away, and now briars and dense under-growth mark the spot that was once La Grange. The first year of the existence of the College at its new location in Florence was the most prosperous in its history. One hundred and ninety students attended from a half-dozen States. Florence Wesleyan University flourished until it was interrupted by the War between the States. It was filled with a large number of students the year the war began. In time, Florence Wesleyan University and two other Methodist Colleges in the State of Alabama were turned over to the State. 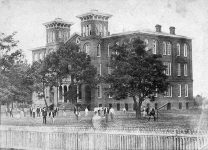 Florence Wesleyan became was reestablished as the first state-supported teachers’ college south of the Ohio River in 1872. 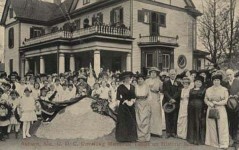 A year later, it became one of the nation’s first coeducational colleges. In 1929, the school received another name change as, Florence State Teachers’ College which offered a four-year curriculum in elementary education. In 1957, the addition of a graduate program initiated another name change to Florence State College. The college received two more name changes; in 1967 to Florence State University, and on August 15, 1974, to the University of North Alabama. 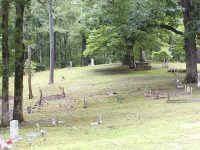 LaGrange College Historic Site is now a pioneer park, antebellum village, and historic cemetery located in northwest Alabama, 8 miles southeast of Muscle Shoals and 4 miles south of Leighton. My oldest granddaughter, Madelynn Formby, goes to that school. Ladies softball member.